Phil Sparling leads this morning’s session at the Central Focus Retreat. Charis Fellowship ministry leaders from around the central region of North America are gathered this week at The Lodge near Syracuse, Ind., for the Central Focus Retreat. 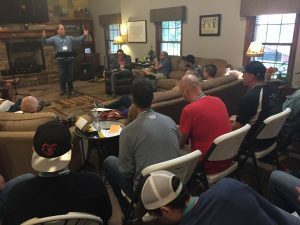 Pastors have traveled from the Toronto area, Chicago, and Ohio, in addition to those from Indiana, for 48 hours of rest, relaxation, fellowship, and time to connect with one another over topics related to ministry and the Charis Fellowship. The retreat began late Monday afternoon with worship led by Erik Jensen, campus pastor at the new Cambridge, Ontario, campus of Renew Church. Jim Brown, senior pastor of Grace Community Church, Goshen, Ind., shared how the Goshen congregation came to own The Lodge, a 40-acre lakeside camp on the north side of Syracuse. Clancy Cruise, executive director of the Charis Fellowship, is leading the sessions, which is focusing on how best to move the Charis Fellowship forward. This morning, Phil Sparling, pastor at Grace Community Church, Auburn, Calif., who will be taking the reigns as executive director of the Charis Fellowship next year, spoke this morning. Focusing on 1 Corinthians 3 and 4, he encouraged those attending be faithful stewards of what God has entrusted to them. “We have to be trustworthy,” he said. He noted four things that are important for moving forward. He said that God causes the growth. “Messengers don’t cause anyone to grow spiritually,” he stressed. Third, he noted that we should do what God has called and equipped us to do. Finally, he stressed that everything in life is to help us grow. “In this room are the answers that you need to help you move forward,” he concluded. “God has helped everyone in this room to solve a problem. You have to ask,” he added. This afternoon, retreat participants had the afternoon free to explore the camp, golf, rest, or do other things, concluding with a fellowship dinner on their own at an area restaurant. This evening, they will gather for three-fold communion. The retreat concludes tomorrow in Syracuse. Click here to see images from the retreat.